Luxurious Casa Valerie is located above the ocean and boasts breathtaking views of Los Arcos rock formation, the Bay of Banderas, and Mismaloya Beach, as well as the scintillating night lights of Puerto Vallarta. A beautiful wrought iron door opens up into this 10,000 square foot, 7 bedroom, 7.5 bath luxury villa in Puerto Vallarta. Luxurious Casa Valerie is located above the ocean and boasts breathtaking views of Los Arcos rock formation, the Bay of Banderas, and Mismaloya Beach, as well as the scintillating night lights of Puerto Vallarta. Enjoy a 180-degree view of the Pacific Ocean from every luxurious corner of Casa Valerie. The clean lines and dramatic open spaces contrasted by the vibrant local colors and textures makes this contemporary home one of Puerto Vallarta's most luxurious properties. The master suite with its marble bathroom makes this room for romance, to luxuriate and relax in. Sip margaritas while watching the sun set, or soak in the Jacuzzi as you watch the sun rising over the mountains. Soaring ceilings, bedrooms with satellite TVs, gourmet kitchen, 40 foot living rooms, 10,000 square feet of poolside terraces are just a few of the amenities Casa Valerie has to offer. Most of the gay spots are on the level ground where the Rio Cuale (Cuale River) empties into Vallarta's Bandaras Bay. This area, a zone often called South Side or Zona Romantica over last few years, could just as well be called homo heights. There is a decided shift away from the straight night spots that so dominate the malecon just north of the city center. South of the city center is where gay men and women are found everywhere. And so are their watering holes, clubs and bars. Vallarta's primary club or disco scene, gay or straight, is pretty late in the evening. Don't plan on much happening at these clubs until well past midnight. Earlier in the evening the happy hour circuit usually starts off at various places where the crowd gathers to watch the sunset. Before the late night action gets going, the places to be are the smaller bars along or near Lazaro Cardenas Street, and also Olas Altas Street. Olas Altas Street, a wonderful side-walk café strewn strip of land where the mountains are closest to the beach, is where everyone walks. Olas Altas has become something reminiscent of a Paris back street, lined with sidewalk cafés, but located in the tropics here in gay Puerto Vallarta. Along Olas Altas Street are several gay bars. All are the kind of places where you'll see activity earlier in the evening. Starting at 10pm the disco clubs get going and they peak sometimes very late, often past 2 in the morning. Trendy gay night life most fabulous nightlife for gays in the world! Blue Chairs In house SPA. Wine Tastings Cooking Lessons Pizza Making In Pizza Oven by pool Hiking Biking Deep Sea Fishing. A beautiful wrought iron door opens up into this 10,000 square foot, 7 bedroom, 7.5 bath luxury villa in Puerto Vallarta. 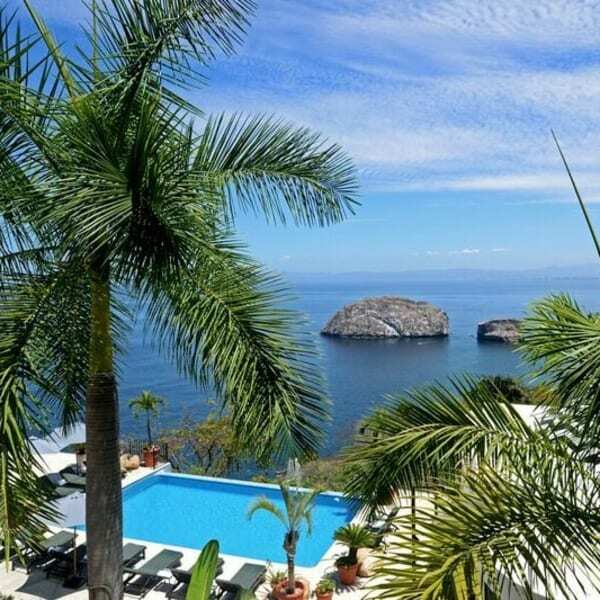 Luxurious Casa Valerie is located above the ocean and boasts breathtaking views of Los Arcos rock formation, the Bay of Banderas, and Mismaloya Beach, as well as the scintillating night lights of Puerto Vallarta. Enjoy a 180-degree view of the Pacific Ocean from every luxurious corner of Casa Valerie. The clean lines and dramatic open spaces contrasted by the vibrant local colors and textures makes this contemporary home one of Puerto Vallarta's most luxurious properties. The master suite with its marble bathroom makes this room for romance, to luxuriate and relax in. Sip margaritas while watching the sun set, or soak in the Jacuzzi as you watch the sun rising over the mountains. Soaring ceilings, bedrooms with satellite TVs, gourmet kitchen, 40 foot living rooms, 10,000 square feet of poolside terraces are just a few of the amenities Casa Valerie has to offer.